"Kent Vaccaro and William Lambros to pilot Momentum Motorsports cars at NJMP"
Millville, NJ (September 13, 2018) – Entering their home event on the 2018 calendar, Momentum Motorsports, along with their partners, the Skip Barber Racing School, enter the penultimate weekend of the F4 United States Championship Powered by Honda. 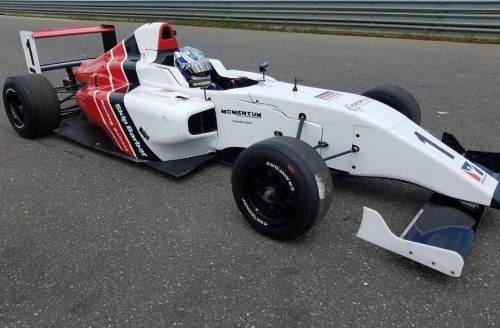 Taking place at their home facility of New Jersey Motorsports Park (NJMP), the Skip Barber Momentum F4 branded program will enter Kent Vaccaro and series newcomer William Lambros. Lambros joins the squad as a former Skip Barber driver and will look to take his skills to the front of the field in his F4 United States Championship debut. Joining forces with Momentum Motorsports veteran Kent Vaccaro, the duo is primed and ready to hit the track for the triple-header weekend. William Lambros and Kent Vaccaro are perfect examples of what the Skip Barber Momentum F4 program was put in place to do. Vaccaro, who has been sporting Skip Barber livery for the second half of the season, has been working hard to promote the elite level racing school to both drivers and potential drivers inside and outside the world of motorsports. Lambros, a graduate of the school and part of the Skip Barber alumni, gets his chance to compete in a national series program courtesy the Skip Barber Racing School. While rounds 13-15 of the F4 United States Championship Powered by Honda will take place this weekend, Skip Barber Momentum F4 are also preparing for their season finale event that will run alongside the Formula One World Championship at the famed Circuit of the Americas. 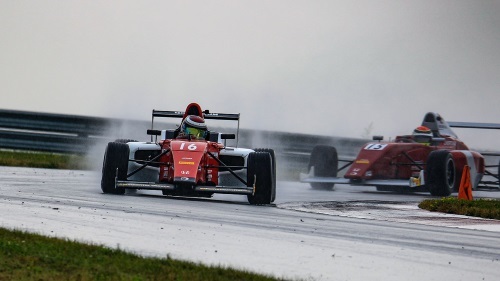 With a couple fully prepared F4 cars available, anyone looking to compete at a world-class facility on the world stage is asked to contact Skip Barber Momentum F4. For more information on test and/or race opportunities with Skip Barber Momentum F4, please contact Phil Picard at phil@philpicard.com or visit the national level race team online at www.MomentumMotorsportsLLC.com or via their social media pages on Facebook, Twitter and Instagram. Please visit www.F4USChampionship.com for more information on the series.